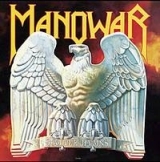 MANOWAR - BATTLE HYMNS VINYL (LP) | Online Shop | Wizard LTD. Album: "BATTLE HYMNS VINYL (LP)"
Throughout MANOWAR's storied career, the band has faced the trials and tribulations shared by most musicians forging a career. Although MANOWAR have been triumphant in their battle to succeed and have stayed their course through rough waters, they've witnessed many other bands fall to the perils of greed and commercialization in the music industry. To that end, MANOWAR created Magic Circle Music to help other bands avoid those pitfalls by giving the power back to the musicians and the fans. Already boasting an awesome roster that includes Rhapsody Of Fire, Bludgeon, HolyHell and Majesty, Magic Circle Music proudly released MANOWAR's Gods Of War. At a time when even bands with the word "metal" in their names dismiss the greatest rock genre ever, MANOWAR's music will never be tainted by trends or diluted by outside pressure. The band's members remain steadfast in their resolve: to deliver to their ever-growing international legions of die-hard fans the brand of metal they demand to hear.